Hammocks are one of my favourite attractions in the Maldives and when I recommend resorts to guests I always try to suggest a resort that comes with nice hammocks. Budget is the first factor I check. No matter how nice the resort is if the budget does not give way the tourist will not be booking it. So, budget comes as the first factor followed by my personal tastes and experiences I got after interacting with guests in resorts and here on Maldives Finest. 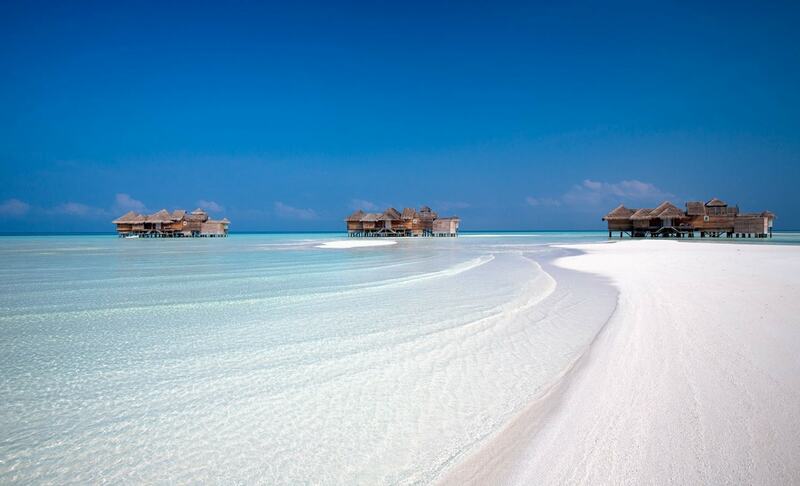 Gili Lankanfushi is ranked as one of best resorts in Maldives. 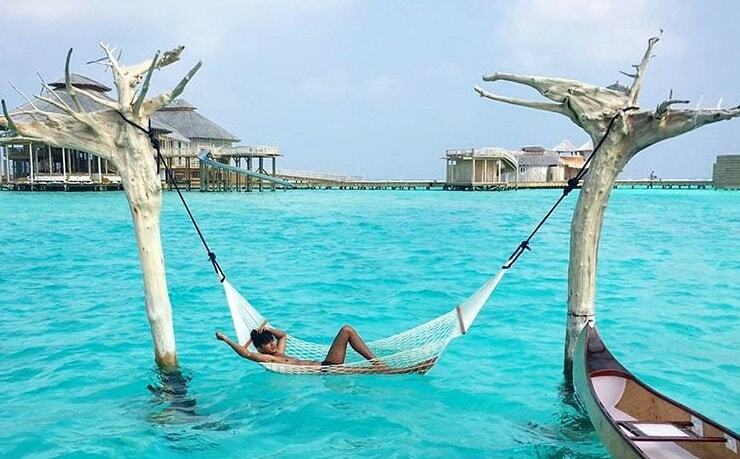 The resort that was named by Tripadvisor as the best resort in the world has an amazing over-water hammock. Nature inspired concept is not only amazing but things like this contributes greatly for guest satisfaction. There are 7 Crusoe Residence at Gili Lankanfushi. These are massive over-water villas for people who want peace and privacy. The villas are totally disconnected from the island and is only accessibly by boat which is made conveniently available day and night. The hammock is situated one side facing the villa and other facing the lagoon that fades into deep sea at a distance. Two sides of the white hammock are held by an uprooted tree erected upside down. It is a beautiful shallow lagoon with crystal clear waters and the amazing concept is loved by all guests visiting Gili Lankanfushi. 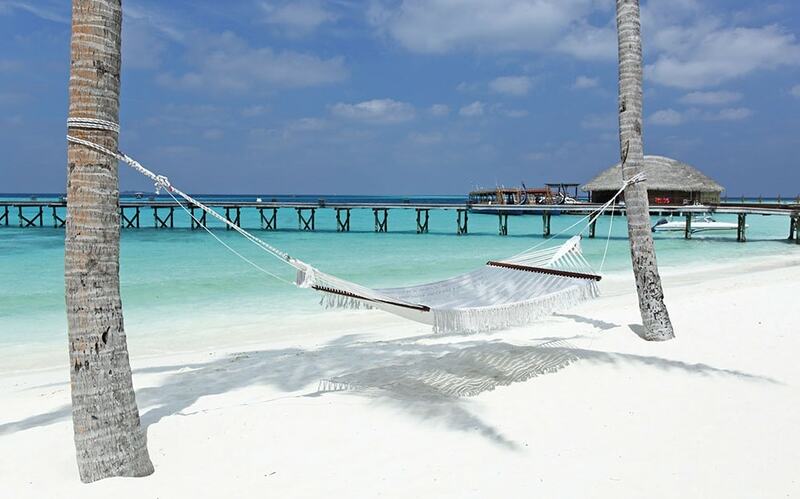 If you are beach lover and still like hammocks Gili Lankanfushi has not forgotten about you. 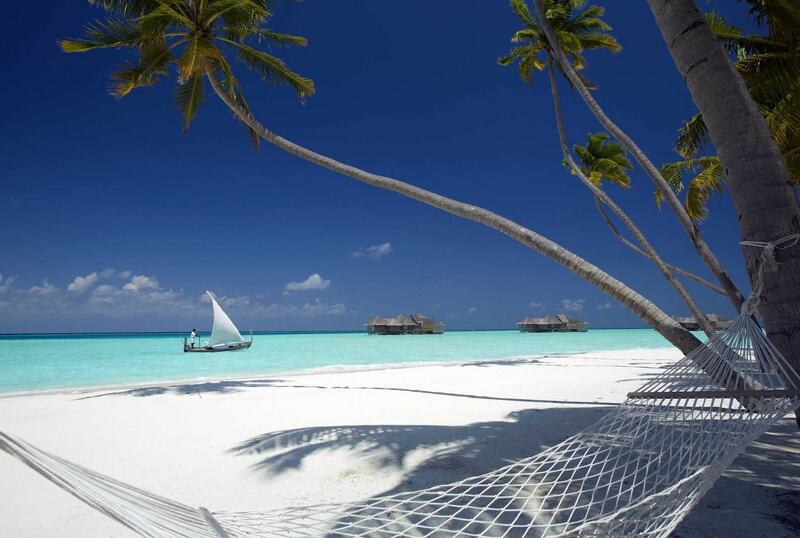 The beach hammock is more attractive with a stunning view of palm tree, beach and the lagoon. Sight of boats sailing around and people enjoy and having fun or relaxing is pleasing to your eyes. Soneva resorts are amazing. This group is doing a fantastic job when it comes to style, comfort and nature inspiration. Maldives is about nature, so when there is a nature inspired concept it blends perfectly. Not only that, Maldives Finest Ranking shows Soneva Fushi is one of the top resorts in terms of guest satisfaction. 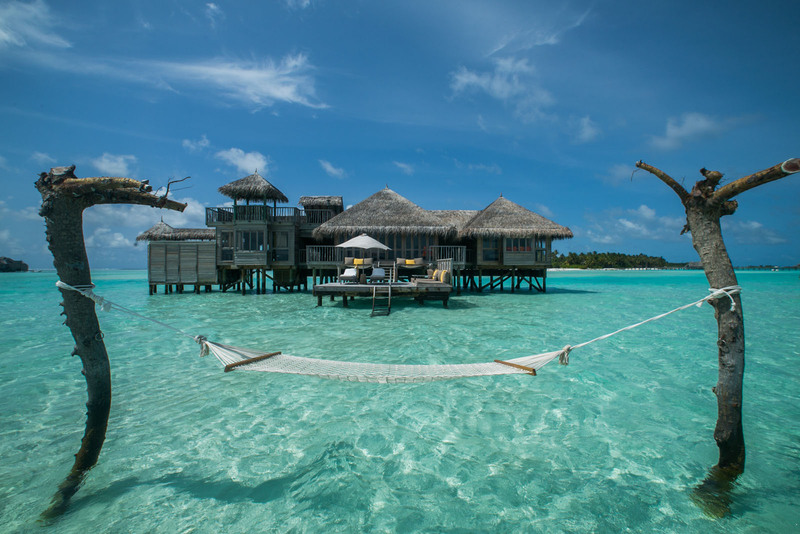 Gili Lankanfushi was originally developed by Soneva Group, headed by its chairman Sonu Shivdasani. Latre it the property was sold out to a Singaporean company that keeps the original concept as it was and ensure it runs smoothly. The latest of the hammock design is the one in Soneva Jani in Noonu Atoll. It is very similar to the one in Gili Lankanfushi. In Soneva Jani the location is a deep lagoon and colour of uprooted tree is more rustic. When you are enjoying this hammock you are partly in water that is when the ride is right. There is a small boat if you want to get there, otherwise you could also swim. The lagoon being deep the water is more turquoise in colour. You could spend hours and hours enjoying this perfect spot. Not everyone can afford two high end resorts on top. Sun Siyam Irufushi is beautiful resort in Noonu Atoll that is relatively large in size. There are over 200 villas on the island. Some years back the resort was managed by Hilton. During their time they built a hammock in the lagoon. It is very close to the beach and gives a great view of the island while you enjoy. Constance Moofushi is another high ranked resort on Maldives Finest Ranking. This resorts offers a great all-inclusive package and that keeps guests happy while overall guest service and facilities are up to the mark. The hammock at Constance Moofushi is unique, it is on the beach but lagoon runs on both sides. This does not stay this way whole year as beach moves. But, it is a beautiful location and hammock is at the perfect place. 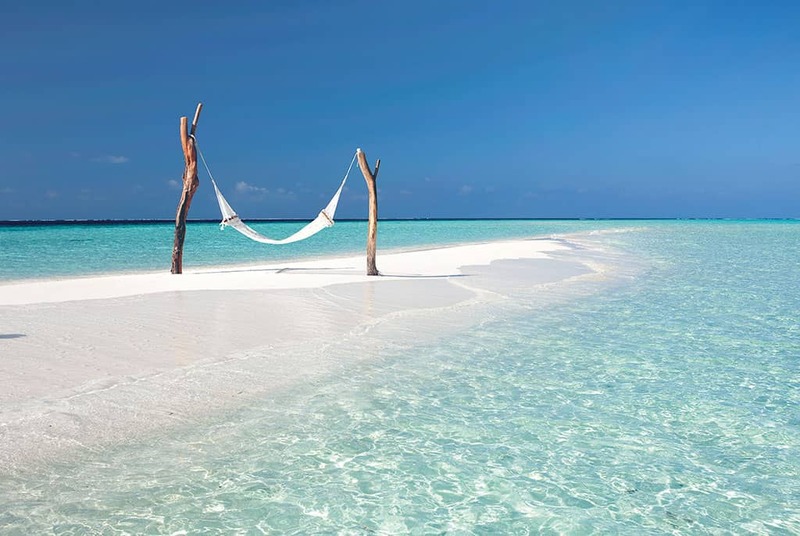 How many of you dream of relaxing on hammock at a sandbank? You could take a nap, read a book or just relax and enjoy the views. Which side you turn or face does not matter at Constance Moofushi beach hammock, you have a great view. If you want relax on a beach hammock and enjoy view of a jetty the place to go is Constance Halaveli. This hammock is lays between two swaying palm trees. Shade of the palm tree goes on the hammock or the beach, depending on the time. This gives you option to enjoy in the shade or in the sun. Palm shade on the beach is a beautiful site. There are various types of hammocks available in the market. In Maldives mostly we have white ones to match with the white sand. It would be great if there is a variety though. I have seen some hammocks that narrow in shape, comes in fabric rather than netting. These fabric hammocks are ideal for camping or taking a nap, it is more comfortable stay in longer but ideal only for 1 person. This camping hammock buying guide showcases most of the types available in the market today. In Maldives we have many luxury resorts. But the growing trend of guest houses comes with a new concept; spend day time enjoy at various islands and get back to guest house to spend the night. This kind of holidays keep you more active and engaged, but it also ample time to rest and relax. For example when you are on a sandbank you swim, rest, sunbathe or snorkel. You have everything happening in your holiday. Guest houses are cheaper but offers an amazing experience as well. So far the role of hammocks in guest house sector is not much.